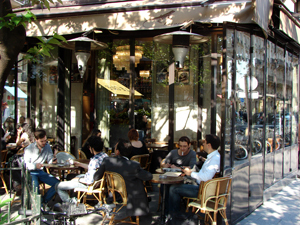 One of the chief joys of Paris is simply relaxing in one of the city’s cafes. 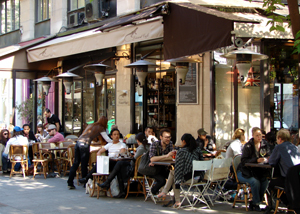 And while a cafe terrace is a perfect spot for a bit of solitude or people watching if you’re on your own, it can be particularly fun on a spring or summer weekend when you’re with a group of friends, the weather is warm and breezy and Parisians are in buoyant spirits. 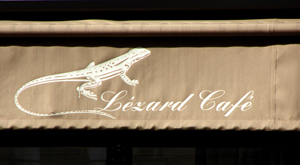 If you’re ever near the Rue Montorgueil shopping street or Saint Eustache church, a perfect spot for a weekend coffee or cocktail is Lezard Cafe. Straddling a V-shaped corner overlooking the super-busy Rue Etienne Marcel, Rue Tiquetonne and Rue Montmartre, Lezard Cafe welcomes a mostly young, stylish crowd to its enormous (and usually very crowded) wraparound patio. Several trees at the triangular intersection provide cool shade for the breezy outdoor space that seats at least 125 people at small tables that can be—and frequently are—pushed together for larger groups. On weekdays, Lezard fills to capacity just prior to noon for its popular lunch, thins out a bit in mid-afternoon, then refills to standing-room-only from 6 p.m. to closing. On weekends, the cafe’s terrace is busy from noon onward. Don’t fret, though–you can usually find a table or two without any problem. And if the terrace is full, there’s seating for about two dozen more inside. Drinks, including cocktails, are available at all hours. Lunch and dinner options include such dishes as duck breast with spicy-honey sauce, grilled steak with bearnaise sauce, penne with grilled chicken and bleu cheese sauce, smoked salmon and even prime rib. At all other hours, a variety of salads, sandwiches and cheese/charcuterie plates can be ordered. L ezard Cafe is marketed as a gay and lesbian establishment, but truthfully the crowd here is more accurately aptly described as “hipster” or “stylish”–young, trendy men and women (gay and straight) who wholeheartedly enjoy the cafe’s ambiance and airy terrace. And don’t worry if you don’t consider yourself a good fit with the cafe’s primary demographic–you can always find people of all ages (including area parents with children) enjoying Lezard’s charms. Check it out this weekend if you’re in the neighborhood! Hours: Daily, 9 a.m.-2 a.m. This entry was posted in Cafes and Bistros, Drinks, Food, Right Bank, Rue Montogueil and tagged Lezard Cafe, Rue Etienne Marcel, Rue Montmartre, Rue Montorgueil, weekends by Bob Adams. Bookmark the permalink.